Ezk 2:8-3:4 "Son of man, eat what I'll give you." I saw a hand stretched out to me with a scroll he unrolled. Written on it: Lamentation, wailing, woe! "Eat it, then go speak to Israel." I ate it. "Fill your stomach with it." It was as sweet as honey. "Go to Israel and speak my words to them." Ps 119:14, 24, 72, 103, 111, 131 "How sweet to my taste is your promise!" I rejoice in your decrees; they are my counselors, more precious than gold. I gasp open-mouthed in my yearning for your commands. Creighton: Children have deep faith and capacity for intimacy, tenderness, trust, compassion, and reverence but are taught not to trust; we become less innocent, less able to be intimate, less able to be religious. We struggle to return to wonder, trust, and surrender. To turn and become like children, we first see how we've strayed, then seek a freer spirit, and submit to and be dependent on God. If we receive one another in poverty and simplicity, others can become childlike too. One Bread One Body: Many Christians prefer food the world offers to God's nourishment; consumerism is more appetizing than "lamentation...." But God urges us to "long for pure spiritual milk as newborns, so you'll grow into salvation" (1 Pt 2:2). Eat what God gives you, not candy from strangers. DailyScripture.net: Children in Jesus' time served their parents as household staff, with no rights, position, or privileges, but Jesus elevated them, placing one in the position of honor, his right. The humble are the greatest, emptying instead of asserting themselves through service. / Jesus: seek out the sinner. Do I pray for and seek after the lost? Passionist: "Unless you change and become like children...": Fr. Carroll Stuhmueller, C.P. re leadership thru change: 2 levels of leadership: external re matters of the "99 sheep," routine stuff that causes change; internal, Spirit-led, intuitive, courageous, heroic, radical, inspired expresses God's will, wakes people up, demands we be alert, childlike, use our 1% lost-sheep self. 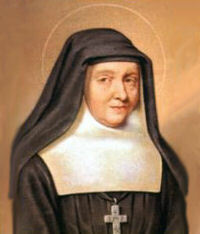 Jane Frances de Chantal, after depression (husband, 2 children died), found her 1% and founded an order for nuns to serve the sick and the poor. / Ezekiel: don't rebel; eat the word that's given us. Consuming the Word feeds the child in us. Sweet taste = actions bringing hope, relief, comfort, direction, and gratitude.